Rush Limbaugh Pursuing the Rams? Would the universe implode if he traded for Donovan McNabb? Aside from his short-lived experiment with ESPN's Sunday NFL Countdown, Rush previously worked in promotions for the Kansas City Royals and frequently references his sports fandom on his show. Speculation on Limbaugh as an owner has intensified since owner Georgia Frontiere died. 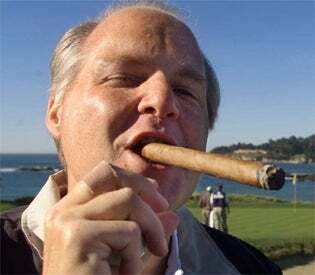 Limbaugh also signed a $400 million dollar radio extension in early July which could help a bit with the finances. Befitting his quiet nature, Limbaugh did not tamp down the speculation in an interview with the St. Louis Business Journal last Friday.